HERE ARE THE PROGRAMS for the International Society of Biblical Literature conference and the International Organization for Qumran Studies conference, which happen together in Groningen in late July. I'm scheduled to present a paper at each. As the directions say, "To see the entire preliminary program book, leave all the fields blank and click the submit button." The British began discovering Gandharan Buddhas in the late-19th century, and one of the first men to be dazzled by them was a young Hungarian Jewish emigre intellectual called Aurel Stein. He spent hours in the Lahore Museum, then run by Rudyard Kipling's father, studying the beautiful sculptures. Intrigued, he soon began walking the Karakorums to find further relics of this unlikely Greco-Buddhist world. Trade and religion were often fellow travellers: in Syriac, the language of west-Asian trade, the word for merchant ("tgr") was the same as that for missionary. One religion that travelled eastwards along the Silk Route, and was brought to Central Asia by Mesopotamian merchants, was Manichaeism. It was founded by the prophet Mani in Babylon in the third century AD. Brought up in a heterodox ascetic environment where Christian and Jewish Gnostic ideas mingled with Zoroastrianism, Mani went on a pilgrimage to Gandhara where he encountered Hindu and Buddhist ideas. Conceiving all creation as the product of a great struggle between light and dark, good and evil, he saw his religion as a fulfilment of all these different religious currents, and accepted Adam, Zoroaster and the Buddha as prophets, while also subscribing to the Hindu idea of the transmigration of souls. His ideas rapidly spread from Carthage in the west (where the young St Augustine briefly converted to Manichaeism) to Xi'an, the Chinese terminus of the Silk Road in the east, before disappearing by the late Middle Ages. Stein's discoveries of a Manichaean library recovered not only several of the sacred texts of this lost faith, such as the Great Hymn of Mani, but also images of the vegetarian Manichaean elect, in long white robes and tall, cylindrical hats. Perhaps the strangest image in the show is an eighth-century fragment showing Jesus as an unbearded Manichaean prophet, mounting to heaven in a crescent-shaped moon boat. No less strange are the relics from the brief moment when Central Asia converted en masse to Nestorian Christianity. Expelled from the Byzantine empire in the fifth century, the church had taken root with astonishing speed further to the east. By the seventh century, Nestorian archbishops watched over cathedrals as far apart as Bahrain, Kerala, Kashgar and Lhasa. By 660AD there were more than 20 Nestorian archbishops east of the Oxus, and Nestorian monasteries in most Chinese cities.
. .. . But nothing in Zeitun can match the most beautiful image in the Silk Route show: that of a Nestorian Christian saint from Samarkand, which at first sight appears to be Buddhist. The figure is wearing Buddhist-style robes and is sitting cross-legged in the mudra of preaching; only the two Maltese crosses that the saint is wearing - one on his headdress, the other on his torc - shows his true faith. We want to follow up on this matter. You know, Shlomo Ben Ami has just published a book in which he basically says that he failed to reach an agreement with you, your people, at Camp David and Taba, and he believes that it's impossible to reach an agreement with you. There is one point which he dwells on very, very prominently in his book. He says that Israel under Barak was prepared to concede sovereignty over the Temple Mount to the Palestinian state, and the issue was archaeological excavation underneath the Temple Mount. And he says that the Palestinian side at Taba was prepared to undertake not to dig under the Temple Mount, but was not prepared that the agreement should mention a historical connection between the Jewish people and that place. Ben Ami says that to him, this meant that you, Yasser Arafat, don't recognize the historical connection between the Jewish people and this land. "It is in our Koran. The holy story of Joseph before he went to Egypt, in our Koran, in the tales. Who can say, therefore, that there is no relation [between the Jews and the land]? Do you forget that we are not calling you our cousins? Actually you are my cousin. I am from Abraham, Hagar, my grandmother was Hagar, and you are from Sara ... yes or no? Yes, I believe that, and do you believe that? "Definitely. This is my grandfather - Abraham ... your grandfather, and he's my grandfather also. You are from ... Yitzhak and Jacob. So it is clear, historically ..."
Jerusalem ... Nablus is not a practical question, a practical question is Jerusalem. "The practical question, Jerusalem, means Salem - the king who were there when Abraham came, Lot ... yes? He received them in a very friendly, brotherly ..."
Malkitzedek, in the Bible he is called Malkitzedek - king of Salem. "And you, when Sara died he got the cave in Hebron to bury her there, and still there is an agreement between us, that you have the right to go to visit this cave which is a part of the Abraham mosque in Hebron ... You are forgetting this ..."
What are you saying? Can I get a little bit deeper. What are you saying about the king of Salem? What are you implying? That you identify with with the king of Salem? But you said before that you descended from Abraham, from Abraham through Ishmael? "Yes, yes but we and you were cousins." "Abraham, yes, but we became citizens. We stayed here and you went where?" When it comes to Jerusalem, and to Haram al-Sharif, if Yitzhak Rabin came to you and told you, you can have sovereignty on Haram al-Sharif, what kind of arrangements, practical arrangements, would you be willing to give the Jews who want to pray there? "It is clear what I had accepted in Camp David: The Wailing Wall, the Jewish Quarter, with a passage freely under your control." What about what we call the Temple Mount and you call Haram al-Sharif? Under your control, would you accept Jews to worship there, to pray? Or only at the Wailing Wall? "Until now, you have not found anything [in archaeological excavations] referring to the [Solomonic] temple ... You found Herod's temple." Well, what's the matter with that? Why isn't that old enough for you? Herod's temple stood 2,000 years ago. That's the temple that Jesus walked in, it was a Jewish temple. What's the difference to you ... With all due respect, what's wrong, what's inferior - in your eyes - the temple of Herod to the temple of Solomon? The Jews were praying in the temple of Herod more than 2,000 years ago. Is that a historical fact? I wish the interviewer had pressed him on this last question. It's the first time I've heard Arafat apparently acknowledge that Herod's temple stood on the Temple Mount. But in what we're given of the interview he he doesn't give a straight answer to that question "Is that a historical fact?" There are an awful lot of ellpses throughout, but they seem to represent pauses in speech rather than edited text. What he seems to be saying, as far as I can make sense of it, is that Jews would not be allowed to pray on the Temple Mount on the grounds that, although Herod's temple stood there and there is archaeological evidence to prove it, there is no surviving archaeological record of Solomon's temple. As for all the stuff about Salem, Melchizedek, and Egypt, whatever he's trying to say is not clearly expressed. I could make a guess or two as to where he's heading with it, but I'd rather not. I hope interviewers continue to push him to clarify what he means. SOME STARTLING CLAIMS about the Dead Sea Scrolls appear in this article, but in the last week I've blogged on one or two other pieces pertaining to paleo-Judaica which weren't all that much more accurate. Yemenite expansion in Africa, in terms of population, language and scripture. Despite the lack of unity, or perhaps due to this phenomenon, many waves of Yemenites have reportedly crossed the Bab el Mandeb straits, and settled either in the African Red Sea shore opposite the Yemenite coast, or further in the African inland. What the famous Abyssinian legend and the great epic text Kebra Negast (the Glory of the Kings) narrate is rather an extension to the Biblical and the Quranic texts� references to the legendary Queen of Sheba � Balqis � Makeda, and to her contacts with Solomon, the King of Israel. But it reflects perfectly well the reality of the millennium-long, repeated Yemenite waves of Asiatic immigrants to the Horn of Africa area. Menelik, as son to Solomon and Balqis � Makeda, is an abstraction made for poetic reasons within the text, and it concerns all the numerous Yemenites, who repeatedly and in successive waves expressed their predilection for Africa. It is not only literary sources and archaeological evidence that testify to this event; full epigraphic and linguistic support is offered for this assertion, since the ancient Abyssinian language and scripture (dating back to the early Christian era) have derived from the earlier attested ancient Yemenite semitic dialect and syllabogrammatic writing. Gueze, as is called the ancient Abyssinian language, is very important to Christianity, as one of the languages and the scriptures of the Evangiles and the New Testament � along with Aramaic - Syriac, Greek, Coptic, Latin, Armenian and Georgian. Gueze is the ancestral linguistic form of modern Abyssinian languages like Tigrinia, Tigre and Amharic (Amarinia) that are widely spoken in Eritrea and Abyssinia. The name itself of Abyssinia (�-b-sh-t, Abashat) is mentioned in Ancient Yemenite texts and epigraphic documentation as the name of a � Yemenite tribe! This tribe, or at least a sizeable part of it, migrated to Africa and transferred there its name that lasts until now, as ultimate proof of the Yemenite origin of a large part of the populations of Abyssinia and Eritrea. �Returning� the compliment, Gueze � that was never lost, since it still is the religious language and scripture of the Christians of Ethiopia and Eritrea � helped a lot in the deciphering of the ancient Yemenite epigraphic monuments. It was as useful as Coptic to Champollion deciphering Egyptian hieroglyphics. Without Coptic, Champollion would have failed; without Gueze the likes of Conti Rossini and Rhodokanakes would have failed too. For more on ancient Near Eastern writing systems, including South Arabian ones, see this Columbia Encyclopedia article on "Afroasiatic Languages," especially the last few paragraphs. HOUSTON -- Hidden for almost 2,000 years in remote caves in the Judean desert, the Dead Sea Scrolls will be exhibited at the Houston Museum of Natural Science from Oct. 1 through Jan. 2, 2005. This unique exhibition, rarely seen outside of Jerusalem, includes actual fragments of 13 of the scrolls written more than 2,000 years ago, including pieces from the books of Exodus and Psalms. Other fragments in the exhibit are from Enoch, Pseudo-Ezekiel, Thanksgiving Psalms, War Rule, some Torah Precepts, Damascus Document, Community Rule, Phylactery, Nahum Commentary, Leviticus Va-Yikra and the Calendrical Document. There are also numerous artifacts from the ancient Dead Sea settlement of Qumran near the caves where the scrolls were discovered. Artifacts include jars identical to those the scrolls were hidden in, ancient coins, leather sandals and an inkwell believed to be connected with the writing of the Dead Sea Scrolls. Abstract: The current consensus in Ephesians scholarship regards the letter's second chapter as an expansion or continuation of the blessing and thanksgiving section from ch. 1, maintaining that it does not contain any cogent theological argument or even a clear and consistent line of thought. This article challenges the consensus by reading the chapter through the lens of the ideology of divine warfare, which is found in texts throughout the ANE and utilized in both the Old Testament and New Testament. It is argued that reading the text through this paradigm brings to light the contours of the author's argument, which is a listing of the triumphs of God in Christ that vindicate the claim that Christ has been exalted as Lord over all things (Eph. 1.20-23). Requires a paid individual or institutional subscription to access. Hanna STETTLER, �Sanctification in the Jesus Tradition� , Vol. 85(2004) 153-178. ������� According to the Synoptic Jesus tradition, Jesus brings about the eschatological sanctification of Israel promised in Ez 36,22-32 and 37,28. He ushers in the time of the Holy Spirit, and gathers God�s eschatological people, which includes sinners as well as Gentiles. Moreover, he sanctifies people by healing and cleansing them, and teaches them to live a holy life. According to Jesus, the holiness of God�s holy people is no longer jeopardized by ritual impurity. This is not because ritual purity is irrelevant per se, but because in Jesus, the "Holy One of God", God�s holiness has come into the world. Jesus sanctifies people and time so completely that the intention of the ritual Torah is fulfilled. Holiness is now to be lived out through mercy and love, even for one�s enemy. Peter WICK, �Jesus gegen Dionysos? Ein Beitrag zur Kontextualisierung des Johannesevangeliums� , Vol. 85(2004) 179-198. ������� The author of the article intends to show, that not just the episode of the "miracle at Cana" (John 2,1-11), but the gospel of John as a whole disputes in an implicit way the worship of Dionysos, which was wide-spread in Syria and Palestine. Jesus is presented as the true son of god, who surpasses the god Dionysos in every way. John represents the old Jewish tradition of disputing the worship of Dionysos. This dispute implies the rejection as well as the surpassing adoption of Dionysian elements. The author of the gospel strengthens the identity of his communities, which are confronted by the Hellenistic world, by arguing as a scripture-rooted Jew within the symbolic world of the Hellenistic mainstream. Kenneth D. LITWAK, �Israel�s Prophets Meet Athens� Philosophers: Scriptural Echoes in Acts 17,22-31� , Vol. 85(2004) 199-216. ������� Generally, treatments of Paul�s speech note biblical parallels to Paul�s wording but find no further significance to these biblical allusions. This study argues that Luke intends far more through this use of the Scriptures of Israel beyond merely providing sources for Paul�s language. I contend that, through the narrative technique of "framing in discourse", Luke uses the Scriptures of Israel to lead his audience to interpret Paul�s speech as standing in continuity with anti-idol polemic of Israel�s prophets in the past. As such, read as historiography, Luke�s narrative uses this continuity to legitimate Paul�s message and by implication, the faith of Luke�s audience. Luke�s use of the Scriptures here is ecclesiological. S. VAN DEN EYNDE, �Crying to God Prayer and Plot in the Book of Judith� , Vol. 85(2004) 217-231. ������� If prayers are defined as communication in which prayers receive a response from God, this implies that they have a function as regards the plot of a story. As a test case, the impact of praying on the plot as well as the characterisation in the book of Judith (containing 21 references to praying) is analysed. The specific characterisation of God through prayer affects the plot. Apart from their importance for characterisation and plot, the prayers in Judith contribute in their own way to the development of its main theme: who is truly God, Nebuchadnezzar or YHWH? Ph. GUILLAUME, �Metamorphosis of a Ferocious Pharaoh� , Vol. 85(2004) 232-236. ������� The common translation of the tannin of Exodus 7 as a mere snake misses the powerful mythological overtones of the whole passage. The editors of Pg are drawing on imagery from Ezekiel to mythologize Moses� morning encounter with Pharaoh on the river bank. Ben Sira was well aware of these connotations and turned them into a joke against Pharaoh. Lena-Sofia TIEMEYER, �"The Haughtiness of the Priesthood" (Isa 65,5)� , Vol. 85(2004) 237-244. Nadav NA�AMAN, �Death Formulae and the Burial Place of the Kings of the House of David� , Vol. 85(2004) 245-254. ������� The article re-examines the death formulae of the kings of Judah, in particular those of the kings from Hezekiah onward. It is suggested the kings of Judah in the tenth-eighth centuries BCE were buried in the palace, and that Hezekiah transferred the burial place of the kings of Judah to a new site (the garden of Uzza) outside the walls of Jerusalem. Hezekiah�s decision to transfer the burial place might have been influenced by the admonitions and possible pressure of the temple priests, who felt that the burial in the palace defiled the adjacent temple (see Ezek 43,7-9). The change in the closing formulae of the late kings of Judah should be explained on the basis of the reality of the late monarchical period and the objectives of the authors of the Book of Kings, and in no way indicates an early edition of the Book of Kings as some scholars suggest. Daniel AYUCH, �La instauraci�n del Trono en siete septenarios. La macronarrativa y su estructura en el Apocalipsis de Juan� , Vol. 85(2004) 255-263. ������� This article investigates the function of number seven as a narrative device and as the main structural pattern in the macronarrative of the Book of Revelation. Considering the final instauration of the Holy Throne in heaven and on earth as the plot of the story, the structuring of the book in septenaries leads the reader through a gradual fulfillment of the New Creation and to the ultimate destruction of evil. Armin D. BAUM, �Der m�ndliche Faktor: Teilanalogien zu den Minor Agreements aus der Oral Poetry-Forschung und der experimentellen Ged�chtnispsychologie� , Vol. 85(2004) 264-272. ������� The view taken by G.D. Fee and others that oral tradition played a major role in the development of the minor agreements is supported by analogies from oral poetry (M. Parry � A.B. Lord) and cognitive psychology (E. Hunt � T. Love). I have linked to the HTML versions of the articles. You can also find links to downloadable PDF versions on the issue's web page. The world-wide occurrence of marine fossils in high elevations can explain why stories of a great flood are found in the folklore or legends of ancient peoples in diverse places around the globe (Bright 1961; Wickersham 2000: 66-69). It is understandable that primitive peoples had no other conclusion to draw than that a deep flood, one like no other in their experience, must have put those seashells way up there. They did not know about mountain building and the geological processes that can raise fossil-bearing, sedimentary rock strata to great heights. In their minds, the mountains and hills had always been there, just as they saw them, from the beginning of time. The mountains never changed over their lifetime or even over generations. They had no way of knowing about the slow geological processes that we know about today. The occurrence of marine fossils in high elevations also explains the ancient conclusion that a flood that deep must have covered the whole earth. To the ancients, a global flood also seemed to nicely explain why seashells were found on the hills and mountains in distant countries as well. SUMMER CONFERENCE UPDATE: Programs etc. are now available online for some upcoming conferences in Europe. Some details are also available for the meeting of the International Organization for Septuagint and Cognate Studies (30-31 July, Leiden), but no full schedule yet. I'm already signed up for four other conferences this summer and will be attending a fifth here in St. Andrews, so I'm sorry to say I shall not be able to go to any of these. The collapse of the Tower of Babel is perhaps the central urban myth. It is certainly the most disquieting. In Babylon, the great city that fascinated and horrified the Biblical writers, people of different races and languages, drawn together in pursuit of wealth, tried for the first time to live together - and failed. The result was bleak incomprehension. Ambitious technology defying the natural order was punished as the tower that tried to reach the skies collapsed. Irreligion and promiscuity inevitably conjured the apocalypse. Unlike Egypt, which in popular imagining continued serene through the centuries, Babylon is seen to have flourished and fallen again and again, the reading of each episode informed and deformed by those that went before. Mythical or historical, they go on and on: the Tower of Babel; the conquests of Nebuchednezzar and the invasion of Babylon by Cyrus and then Alexander; the glorious court of Haroun-Al-Rashid; the devastation of Baghdad by the Mongols in 1258, where the Tigris ran black with the ink of the manuscripts from the ransacked libraries. Is there any other culture for which the distant past, real or imagined, still wields such power? If you want to understand day by day the turmoil of Iraq now, you can of course gorge on newspapers and television bulletins. But if you have any energy left, you should go to the British Museum and see a different kind of reportage. Strawn, Brent A.,and Nancy R. Bowen,eds. Altman called me and sent me some photographs. I told him something similar to what you wrote in your response: those shapes to which he directed my attention did look like Arabic numerals but that did not mean they were Arabic numerals. That is, the quotation farther along in the article is closer to what I said. I did not wonder who could have put Arabic numerals in the Isaiah scroll margins or other spaces. I did say that to check something like this it would be necessary to look at the scroll itself. Incidentally, I do not say "gonna"! For many years Notre Dame professor James C. VanderKam has studied photos of the Dead Sea Scrolls. But he was startled recently when he noticed what appeared to be the Arabic numerals �3� and �2� written between lines and in the margins of the documents supposedly written more than 2,000 years ago. 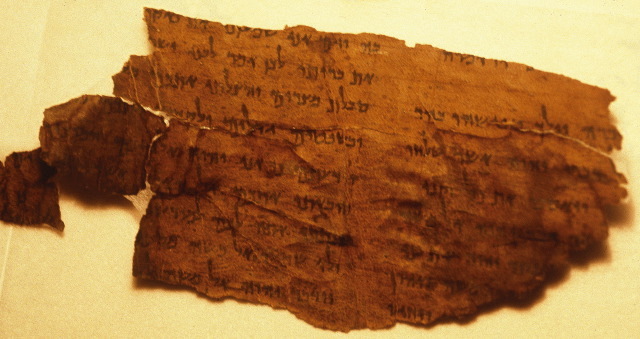 �When could that have been put on there?� the veteran scholar wondered after seeing what looked like an upside-down number �3� in the margin of the Great Isaiah Scroll, one of many scrolls considered to be the greatest archaeological discovery of the 20th century. To put it simply, the treatment of VanderKam in the article is inaccurate and self-serving. In particular, the opening paragraphs quote him as saying something he did not say and they give the impression that he "noticed" these marks when it was Altman who sent him photos and telephoned him about them. The word "noticed," used twice, misleads one to think that this arabic numerals business was VanderKam's idea. (The article did cause confusion about what VanderKam thought over on the Textual Criticism list.) The later paragraph is more accurate, apart from the "gonna." I'm not going to bother resenting Altman and Crowder. As I said earlier, they have been pushing this notion (I don't think it deserves to be called a "theory") for years. No one who is actually a specialist in the Dead Sea Scrolls takes them seriously. But what I really do resent is that the Kansas City Star, in theory a reputable news organization, seems to have accepted the article as-is, without first running it by some specialists in Dead Sea Scrolls (or ignoring them if they did) and without fact-checking even to the point of asking VanderKam if his views were properly represented. I've always been suspicious of the media, but running this blog for more than a year has really opened my eyes to just how irresponsible they are. And it they weren't so irresponsible, the Altman's and the Crowders of this world would not get the undeserved public attention that they do get. Shame on you, editors of the Kansas City Star. I haven't the time and energy to check with everyone else quoted byAltman and Crowder to see if the quotations are accurate. But if you are one of those quoted please let me know. And if you are in touch with one of those quoted, I would be grateful if you would alert them to the article and ask them to let me know what they think of how what they said was presented. UPDATE (15 June): I didn't link to the Textual Criticism list above because it was configured to be readable only to subscribers. But the listowner has now changed the configuration so that the messages are available to the public. To follow the discussion of the Altman and Crowder article, start here and just keep moving forward. A message from VanderKam is relayed as well. The fortress used by Jewish zealots at the Dead Sea fell to the Romans more than 1,900 years ago, but Ben-Gurion University geologists are doing all they can to ensure that Masada doesn't fall a second time - literally. A team led by Dr. Yossi Hatzor from BGU's department of geological and environmental sciences has been studying the stability of the site, which is located on the Syrian-African fault line. The recent earthquake whose epicenter was in the Dead Sea area is only the latest reminder of the risks; since King Herod built his palace atop the desert fortress, numerous quakes have occurred there. They've already shored up some iffy bits. MEDIEVAL DEAD SEA SCROLLS? I think not. In fact, according to scholars who have studied the development of writing, the numbers written in these styles and shapes did not begin to show up in Western civilization until around A.D. 1200, long after the scrolls were believed to have been written. �It creates suspicion when you see Western letters and numbers on manuscripts attributed to a Jewish sect that existed before the birth of Christ,� said Peter Pick, former dean of arts and sciences at California's Columbia Pacific University, after looking at a number �3� and letter �x� that can be seen close together between two lines of the Great Isaiah Scroll. What other scholars now wonder is whether these numbers would cast new doubts on the scrolls' age, the identity of their authors and, more important, their legitimacy. Milton Fisher, professor emeritus of Old Testament and former president of the Philadelphia Theological Seminary, was among the first scholars to study the Great Isaiah Scroll when it was first published in 1950. On the scroll, the �3x� is found immediately below the Hebrew word for �I,� referring to God. The translated passage from the Isaiah Scroll is similar to a parable told by Jesus in the New Testament books of Matthew, Mark and Luke: When the owner sends his only son to collect the fruits of the vineyard from the tenants, the parable goes, they kill him. Pick and others said they suspect the �3x� may be a symbol from medieval times (fifth to 15th centuries) for the Christian trinity � God the Father, Son and Holy Spirit � and marks a Christian interpretation of the Old Testament passage. I have the Trever photographic edition of the Isaiah Scroll in front of me as I write this. The alleged "2" appears on p. 13, fifth line from the bottom in the word "I will (not) ask" ()$)L) from 7:12. What the article doesn't say, rather misleadingly I think, is that the "2" is actually part of the last letter, the tip of the lamed. This letter was made with a loop at the top (compare the other lameds in the same line, to the right). It looks to me as though the loop, combined with the natural bumpiness of the leather, has been distorted by the pixelation of the photograph to make the ghost numeral 2. There's no way someone would have written a numeral actually inside the letter - it would be writing in ink on ink. If you look at the word LM(LH ("above" � "heaven" in RSV v. 11) to the right, you can almost see another "2" there in the second lamed, but it's more clearly just part of the loop. In sum, the "2" is clearly an optical illusion. As for the supposed "3x,' which you can find on p. 11, between lines 17-18, under the word "I" ()NY) of Isa 5:5, all I can say is that this is a particularly grubby section of the scroll and there are a great many meaningless dirt marks, probably further distorted by the pixelation. If you look hard enough at these you can start to see all sorts of interesting things. For example, between lines 18 and 19 I can see what looks like the arabic numeral "31" just above the end of the word "from raining" (MHM+YR - ""that they rain" in RSV), and I can see what looks like the letter "J" in our alphabet one more line down, over the word "planting" (NT() in v. 7. I'm sure more staring would produce more such results, but none of them are real. I can't comment on the supposed Chinese letters, because I don't know Chinese, or the supposed Western alphabet letters in other scrolls, because the article doesn't give enough information to locate them. But I will say I'm skeptical. There are numerous converging lines of evidence that place the origin of the Dead Sea Scrolls around the turn of the era, and if this is the best evidence that Altman and Crowder (who have been at this for years) can put forth to challenge that conclusion, I'd say it's pretty secure. Also, I hope very much that Erik Heen was misquoted or quoted out of context in the header above. But just to clarify, here's a news flash: these scrolls are already historically interesting. UPDATE (24 April, 2005): As I had guessed, Erik Heen was also misrepresented in this article. It wasn't "stolen," it was taken to where there were facilities to conserve it. All above board. If that hadn't been done, the article would be saying it was left to rot in a war zone. Baghdad - Iraqi sources have revealed that the Zionist foreign intelligence apparatus known as the Mossad had laid its hands on an ancient Jewish library that was held by the former Iraqi intelligence. The sources said that a special Mossad team a few days after the fall of the former Iraqi regime in April last year visited Baghdad and seized the library in cooperation with the American CIA officers. The military unit that found the archive was the Mobile Exploration Team Alpha, from the U.S. Army. The ancient Jewish library contained precious and priceless copies of the Torah and the Talmud in addition to other writings in Hebrew that dated back 2,500 years. The archive included a damaged Torah scroll, but early reports of a seventh-century copy of the Talmud proved to be unfounded, although rumors continue to circulate that it exists and remains to be found. I'm skeptical. The manuscripts are dated to the 16th-20th centuries C.E. None go back 2500 years or anything close. For a detailed account of the archive, go here. The Jews taken captive into Baghdad at that time during the Babylon era wrote down their scriptures while in captivity. Well, edited some of them anyway and wrote others. I don't have time to go into the details right now, and they're not well understood. The sources said that the American forces arrested the person responsible for the library after their occupation of that Arab country and forced him to open the doors of the cellar where the library was kept underneath the Iraqi intelligence apparatus' building. The library was submerged in water after the bursting of the water pipes in the cellar but the books were intact, the sources said, adding that the library was carried in a direct flight from Baghdad to Tel Aviv. A salvage crew heaped the documents in piles, loaded them into sacks and took them to a nearby courtyard, where they were partly dried. Later they were packed into 27 metal trunks and stored in a refrigerated truck to halt the mold. They were then shipped to Texas, where they were freeze-dried to stop the remaining moisture from causing further damage. They are now at a National Archives laboratory. That would put them in Washington D.C., as the opening of the article indicates. I've been following this story here for over a year. If you want to know more about it, go to this post and just keep following the links back. Ellen Herron deals in the past. But speaking to Mobilians last week, the guest curator and project coordinator of the forthcoming Dead Sea Scrolls exhibit pointedly addressed the present and the future. "In these days of war and terrorism," Herron told the audience, "we can all take a lesson from (the) new Dead Sea Scroll scholars." Before 1990, Herron said later, only seven volumes in the series of Dead Sea Scrolls research had been published. As of last year, 98 editors representing 11 countries and seven religious traditions have examined the scrolls, Herron said; 39 or 40 volumes have either been published or are in the works, she said. "I think in this case, having more chefs, or people who are able to give their input, really enriches the project," Herron said. In turn, she believes study of the scrolls might improve people's understanding of one another. In her preface to the catalog for the Michigan exhibition, she wrote: . . . "But the scrolls have somehow inspired academics to see past personal and political differences to work together. Modern day scrolls research is characterized by close cooperation between scholars from many faiths and nations. The product of these labors would be wanting without the talents and diverse perspectives of all of these people. They have come together to work on these documents that are of inestimable value to us all. Perhaps the true legacy of the Dead Sea Scrolls is their power to bring people together."